Everything you need to know before ordering. We offer free UPS Ground delivery on longboards and orders over $75 in the continental USA. Orders received during the business week (Mon-Fri) will be shipped next day. Orders received on Friday, Saturday, or Sunday will be shipped the following Monday. Please allow 1-3 additional business days for orders placed through our board builder. If you are not satisfied with your order when you recieve it - we'll arrange return shipping free of charge. Returns must be within 30 days of proof of purchase to qualify and in new* condition (unused, never ridden). To initiate a return please contact us. We cannot accept returns on customized products unless the product was manufactured incorrectly or damaged during shipping. Rest assured - we'll take care of you if your not satisfied. With our free returns you can order without worry, knowing if you don't love it, we'll take it back and give you a full refund. Please be sure to read or returns and warranty page prior to ordering. 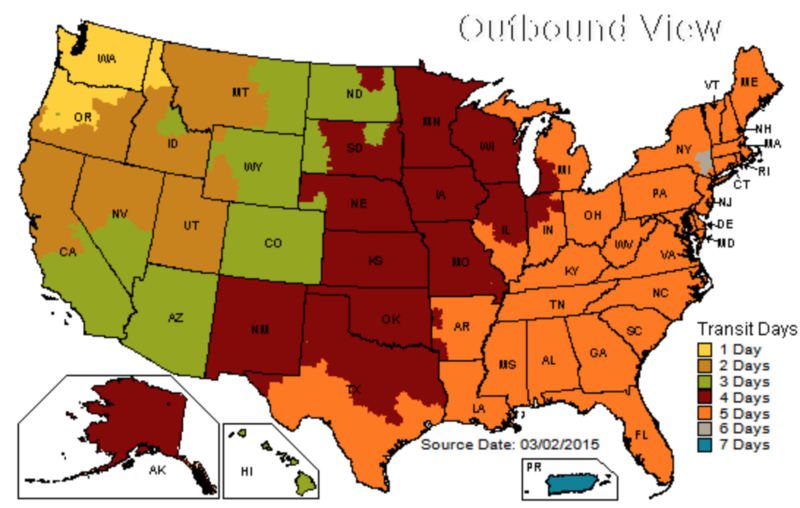 When you select free shipping use the color coded image to determine the transit days for your package. You will receive a confirmation email when you order is sumbitted and a shipping conirmation with tracking number when your order is shipped. Need it faster? Out of State? We've got you covered. Tips and tricks to get your board to Canada. Tips and Tricks for outside North America. Please research your countries import duties prior to ordering.